Rinse the fillets under cold running water and dry very thoroughly with paper towel. Put filets in pie dish or flat casserole dish and add cold milk to cover. Combine the corn meal and seasonings in another bowl. 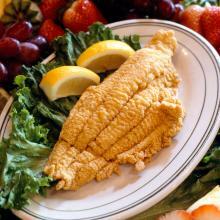 Preheat the vegetable oil in a deep fryer to 375˚ F.
When oil is ready lift catfish out of milk, roll them in seasoned meal and lay them flat and not touching on a platter to dry for a few minutes. Do this in batches of 4 to 6 pieces. You can prepare the next batch while the first one is frying. Fry until golden brown about 5 to 7 minutes per batch. Drain then place on paper towel cover platter in a preheated 200˚F oven. Keep warm until ready to serve. 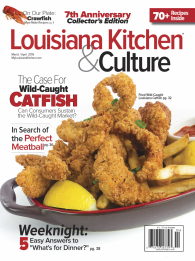 Note: You can find some of the best fried catfish in Cajun country, where they are caught and cooked absolutely fresh. Most catfish are medium to large size. Slice fillets across very thin about 1/4 inch, use sharp knife.